Mother of all Mothers Book Review/Giveaway!! I am so honored and excited to review this true work of art from my dear friend and fellow mama touched by grief and loss, the beautiful and talented, Angela Miller. This gorgeous, real, raw work of art that speaks to the core of a bereaved mother’s heart with love, truth, encouragement, and validation. Gorgeous art from thee Franchesca Cox, and amazing words from thee Angela from A Bed For My Heart . I need to say something. I am a writer. I don’t take words lightly, and I’m quite particular about the use of words as I believe they are a form of art. Words that speak to your soul…words that give the nagging ache or the gaping wound a name…those kinds of words are my therapy. They always have been. I can barely process a feeling without putting the right word to the experience. It relieves me, the release. Words are healing and powerful, just as they can be damaging and destructive. So, when Angela’s words began to woo me, something resonated in my weary depths. Yes. Speak it, sister…write it. Give this gift to the world around you. Watching her find the words…name the twisted agony of a grieving mother’s heart. Watching her process, pour out, filter through, and just say it…set a piece of me free. I have begun to fall in love with Angela’s heart as she posts her piercing words from time to time, upon lovely graphics on the A Bed for My Heart Facebook. I had not taken the time to read her gorgeous essay first published on Still Standing Magazine. The one that resonated as a communal outcry of validation from mothers worldwide, speaking truth into their darkness. Literal beauty rising from the ashes, before our eyes. Women looking through their tears on the computer screen, somehow less alone, if only for a moment, because someone…someone spoke the very words that counteracted the accusing lies in her face, rolling unworthiness and defeat around in her tattered, grief stricken mind, choking away the life. And, someone…someone knows. Someone speaking truth and hope, even while she sits in the pits of moments of her own utter despair. She speaks aloud of the what ifs, the shoulda, couldas and if onlys that plague a grieving mother. She speaks against the lies that say, you failed as a mother. Because speaking it, naming it takes away its power. Her words remind you, mama, clinging to the last thread of hope in the midst of a whole lot of broken…that “you were chosen to be your child’s mother”. Chosen. And, no one is more suited for the role than you…even in loss. She speaks hope in the midst of grief. And, in reading her words…her gorgeous, hope-filled, truth-talking words, I find a kindred spirit. And, I believe you will too. Because we want to share this gorgeous gift, we are giving away a copy of Angela’s book, You are the Mother of all Mothers here on this post!!! To enter, please comment about an aspect of grieving the loss of your baby where you could use some hope…something that was/is a struggle for you, or speak some words of your own hope that you wish to share, born from your journey. For extra entries share on Facebook or Twitter. And, please leave a separate comment for each entry to make counting easier. I am so excited to be one of the bloggers on the He Heard Hannah blog tour! Well, number one…because one of the fabulous authors of the book is my beautiful friend, Lynnette Kraft. And, number two…because He Heard Hannah is an amazing story of God’s grace, redemption, and relentless love. I love the way Lynnette writes from her heart, with genuine honesty. I truly feel as if we are sitting in her living room on the couch chatting as I read her words on her blog, and in her books. (She with her Starbucks and me with my tea and honey, of course.) She is real, and that’s why we love her. Needless to say, I was looking forward to reading He Heard Hannah, knowing that so much of Lynnette’s first book, In Faithfulness, He Afflicted Me, resonated with my own story. Let me just say, I wasn’t disappointed. Lynnette’s story of heart wrenching loss and unimaginable grace facing the death of her daughter Anna, is woven beautifully with Courtney’s journey through depression and other struggles to redemption. We mothers who have said goodbye to our children long to know that their lives mattered to others. We long to see evidence that they impacted this earth. We long to see God’s hand at work, evidence that He sees. Evidence that He is who He says He is. Evidence that He will make all things new. He will bring beauty from the ashes, restore what is most broken, redeem lives marred with sin, and pursue us with His relentless love. This story – the story woven through the lives of the Kraft and Becker families – offers evidence of all of the above. He Heard Hannah is a beautiful testament of the grace our God showers on us. I love the way He worked in the lives of the Kraft and Becker family, and the way He brought them both together. Anna’s life was used to bring healing to a broken heart and salvation to a weary soul. Her life has no doubt brought healing to many hearts…and He continues to use her life to touch the lives of so many. I love the way God works to restore and heal in unexpected ways. And, I’m so grateful to Courtney and Lynnette for telling this incredible story. I am happy to be able to provide a copy of He Heard Hannah to two winners who enter the giveaway on this post, thanks to the wonderful people at Comfort Publishing! As my friend, Lynnette says: “Can I get a YOWPAH? !” All you have to do is leave a comment on this post to enter. Winners will be chosen by Good Friday. And, if you don’t win….buy a copy of the book for yourself! It’s an amazing story, and ya’ll know how much I love a great story! I’m always late to the party. But, I wanted to share something really great with all of you. My dear bloggy friend, September is asking moms to join her in committing to praying for our boys for 21 days using the ebook Warrior Prayers, which can be downloaded here. You can also download it for your Kindle on Amazon. I believe September began the journey a couple days ago, but I just started and caught up (I think). This is a great book, encouraging moms to do the most they can for their boys to help them become godly men: PRAY. And, the technique the author uses is especially effective: praying scripture, something we have done for years in our Moms in Touch prayer groups. This book is full of scripture to pray specifically for boys. I love it!! And highly recommend it. Hope you will click over and read sweet September’s blog and join in. It will be well worth your time! Have a beautiful day! And, don’t forget there’s still time to enter to win a copy of another great book: Hinds’ Feet on High Places. CONTEST CLOSED: WINNERS TO BE ANNOUNCED SOON! Many of you have probably heard of the classic, Hinds’ Feet on High Places by Hannah Hurnard. Dinah always wanted me to read it. We would chat for hours about the spiritual lessons that God was teaching us and the mysterious ways that he would weave His truth and grace into the tapestry of our lives. When I talked of the ways that God brings beauty from suffering and restoration out of brokenness, strength from weakness, and grace that is always sufficient…as I walked through grief and pain and found sweet healing, Dinah would say: “You really need to read Hinds’ Feet on High Places”. Dinah went home to heaven this past February, and a month or two or three (I’m not really good with time these days) later, when I was in the thick of “the missing”, my friend Joyce handed me the book. (Joyce is also one of our faithful, hard-working Comfort Bear ladies.) O.K….o.k., I conceded. Obviously this is a book God wanted me to read! I could just picture Dinah nudging the Lord…”Tell Joyce to have Kelly read this book…she really needs to read it.” Now I’m not sure if that’s how it works in heaven, but down here on Earth, Dinah’s constant suggestions and persistence were quite effective. I wouldn’t put it past her, that’s for sure. Anyway, I started to read the book, and sat astounded at the parallels in my Christian walk as I related to little Much-Afraid with all of her flaws and weaknesses as she struggled to resist her Fearful relatives. Some of the truths that spoke to my heart in this book are the very truths God has revealed to me over the years, as I walked my own path toward the high places, resisting the tools of The Enemy, desperate to know the kind of love that never leaves, embarking on the journey holding the Shepherd’s hand, learning about acceptance with joy in my own desolate Valley of Loss, embracing the surrender that comes from having Sorrow and Suffering (who later became Peace and Joy) as companions, realizing that such journeys lead to the transformation from Much-Afraid to Grace and Glory. All of the truths I have clung to and battled deception with…the very truths I have claimed as my own…truths that defined my walk over the past seventeen years of clinging to God… painted in word pictures by a woman years ago. Even the place I am in now of learning about the love that lays it all down…it’s in there. I thought how silly to think that it is just my walk she is describing, even as the words resonated with my inner core. This is the walk for all who choose to follow Him. Our paths may not look exactly the same, but the truths…the lessons…are all the same. This is one of the most beautiful and perfect descriptions I have read of the ways God works in our lives. Of course, I’m sure it only scratches the surface of His deep mysterious ways. It may seem like I gave the most precious nuggets of this book away, but believe me when I say that you must take the entire journey of reading this book to fully grasp it’s meaning…to fully experience the truth God is whispering about this journey. For this is the story of every Christian’s journey…the one we are meant to walk. The love God pours into our lives is meant to overflow into the lives of those around us. And, everything we experience has a purpose in leading us to being the person He created us to be. Thank you, Dinah and thank you Joyce for sharing this book with me. I’m sure I should have read it years ago, but I was busy living it. I have ordered a few copies to share with others, because it really is a precious picture of the way God works in our hearts to transform us. Truly one of the best books I’ve ever read…and that’s saying a lot! So, of course, I want to give a few copies of this treasure away on this post. Just leave a comment to enter. In other news…for those praying for Tug, there is a VERY important update at the bottom of this post….click over and join us in rejoicing for all God is doing. And, please keep praying as the journey isn’t over!! Thank you so much! Musings on Leaving and Heaven, Summer Reading, and Some Giveaways! You know mama likes to read, right? Well…I do…very much. In the summer, when I was young, I used to spend my time swimming and reading. When I wasn’t riding my bike all over town with my friend, Nicki, of course. Now I spend my summer days catching up on SGM work, walking the golf course as my youngest son’s “caddy” (a.k.a. scorekeeper), swimming with rowdy boys and listening to their boastful talk, and curling up with a book when I’m able. Sometimes, James and I like to lay a blanket in the shade and read outdoors. Ahhh…summer, how I love thee. I’ve already read a couple books this summer, and thought I’d share some thoughts with you. And, you know…give away a copy of some of my recent favorites to a couple lovely commenters on this post. It’s no secret that those of us who have a few “treasures in heaven” often wonder about the place. I admit, when my daughters made heaven their home, a longing was born in my heart that grew from the initial spark that had been placed there when I accepted Jesus as my Savior. Each time I have said goodbye to someone I love, the longing grows deeper and stronger still. This place where there will be no tears, no sickness, no death, no cancer, no bad guys, no leaving, no unmet expectations, no heartbreak, no goodbyes. This place lit by God’s glory…what is it like? We look for hints in His word, hints from the glimpses we have on the sidelines as we’ve watched them leave. Because of the longing and wondering, I enjoy books that share a piece of heaven. And, Heaven is for Real is no exception. I found this book to be quite believable. We want confirmation, don’t we? We want to be sure that His promises are real…that He really is preparing a place for us…as He promised. We have to trust…to believe without seeing, until the day when all will be revealed. For now, I enjoyed the perspective of this book from a little boy’s heart…the child-like faith, the reminder that we will meet our loved ones again, the truth that Jesus is all He says He is, the evidence that our babies live on in heaven’s glory. The part where he meets his sister…the one that his mother carried briefly in her womb, before miscarrying…a sister he didn’t know that he had…of course, I found that part most touching of all. I love that we will know as we are known. My babies, my mother, and so many more….I will be with them one day. What a glorious promise. What a hope we have! I’ve also started Karen Kingsbury’s latest series: The Bailey Flannigan Series, with the first book, Leaving. A fitting title for this season of my life…a mother anticipating her son’s senior year of high school, and a goodbye that seems impossible when just yesterday I was holding his tiny chubby hand to cross the street. Or at least it seems like just yesterday. And, a daughter still working through the loss of her mother five years later. Suddenly thrust back to the moments as a little girl when our family was broken, when I first learned that sometimes dads leave…places of my heart I’d rather not visit. So, why now? If you read here much, you know I love me some Karen Kingsbury. I devour her books, especially those on the fictional Baxter and Flannigan families. 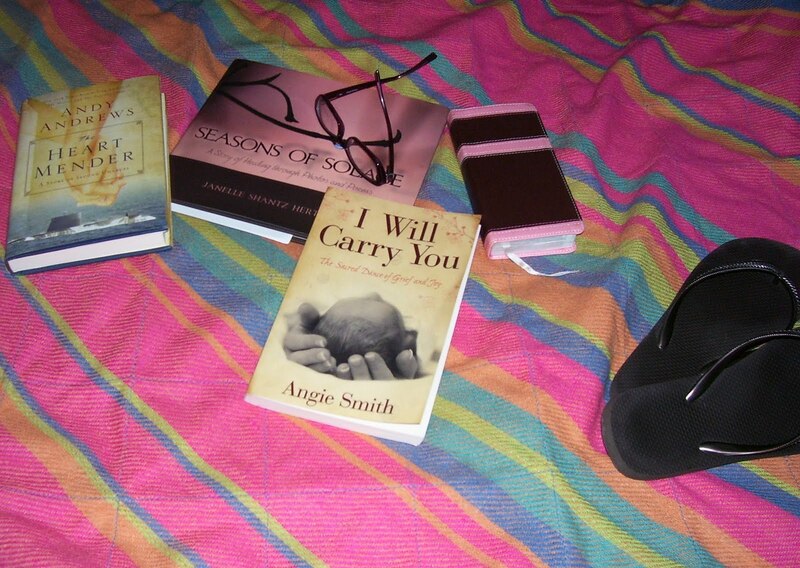 While her books always speak to my heart some truth from scripture, I also read them because they’re entertaining, well-written, captivating, and I can relate to the characters. But this book. Those beginning words drew me in because they were personal. They were the words God wanted me to read right now. For this season of life. Recently, some hurts from my past have been bubbling up, unexpected for a fairly secure, well-loved wife and mama in her mid-thirties. Why now? Why am I having so many struggles with hurts I believed were healed the day Jesus Christ entered my weary, broken heart? What do I do with these feelings, unbidden, but demanding my attention? Is it my mother’s passing…the one earthly constant in my life since birth…that has triggered these flashes of memories, of times when someone I loved…someone I expected to stay…walked away? Was she the bandaid that covered those hurts, like only a mother does…and now they are revealed? What do I do with those feelings? While no stranger to grief, I am not a wallower by any means. So, I’m not a fan of all this emotion bubbling up. It’s been brewing now, for some time. I want to give it all over to the Lord, work through it, get rid of it, stop feeling it all. But, I’m not really sure how to do any of that. So, I pray…I feel…I talk about it to those close to me. And, I wait on Him to work…to lead me to healing and restoration. Everyone leaves. Everyone lets us down. Everyone walks away…whether through decision or death. But, Jesus stays. Jesus stays. Cling to Him. O.K….after all that heavy, how about some fun? 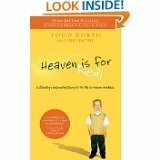 I’d like to give away a copy of Heaven is for Real and Leaving. All you have to do to enter is leave a comment and mention which one you would like or if you would like to win either book, you can say that! Recently, Anthony DeStefano asked me to review his latest children’s book, Little Star. The story is about a Little Star that is ignored and feels useless, until God uses him in a very special way. I was going to tell you my take on it. However, since my son enjoyed the book, I thought you might prefer hearing what he had to say. I will say that I really liked the illustrations. Little Star was lonely at the beginning. Nobody wanted to play with him. The other stars started talking about a king that was going to be born. Little Star shined as brightly as he could to keep the baby king warm. He wanted to shine for Jesus. I liked this book because it seemed like in the beginning he wasn’t important. But, in the end, he made a big difference. Thank you for your help, James….very nice book report…ahem….review. We still love children’s books here, even though my littles are getting rather big. Well, at least James and I still love them! Some of our favorites are the God Gave Us… books. God Gave Us You, God Gave us Christmas, God Gave us Heaven…etc. I think these books help relate spiritual truths to young children at a level they can relate to, and they always seem to speak to my heart as well. (Yes, I’m a huge sap…and still cry when I read most of them.) The illustrations are lovely, and the stories make for very special moments snuggled up to share a bedtime story. They often lead to great discussions, as well. I ordered a couple of my favorites to give away here. I will be giving God Gave Us Heaven and God Gave Us Christmas to two commenters on this post. We have several other Christmas favorites, here too…including The Best Christmas Pageant Ever. I’d love to hear some of your favorite children’s books…so feel free to share! I just wanted to share that there are a few things you can do to help support Sufficient Grace Ministries this holiday season, and beyond. One easy and painless way you can help is by using Goodsearch any time you search the internet, or to make holiday and other online purchases using Goodshop and listing Sufficient Grace Ministries for Women as your charity of choice. You can go to the http://www.goodsearch.com/ website and search there if you don’t want to add the toolbar…or, you can use the Goodsearch button on our right sidebar. Another way to help, is to prayerfully consider making an end-of-the-year donation to Sufficient Grace. We are a 501 (c) 3 non-profit organization. All donations made to SGM are tax deductible, and are used to help us continue to provide products and services to grieving families free of charge, as well as to cover the administrative costs of running this nationwide (and beyond) ministry. Donations can be made safely by clicking on the donation icon on the right sidebar. You can also learn more about sponsoring a family and/or hospital by visiting the Dreams of You Shop page and making a donation there. Our band, One Way, has been invited to do some praise and worship and Christmas music at the Holgate United Methodist Church on the last Sunday of November during their morning service. If you are in the area, we’d love to see you there! One more request, please keep all of the grieving families in your prayers. All holidays and, especially the Christmas season can be extra difficult for those missing a loved one. That’s one of the reasons that we like to give away some extra things to bring some joy to a difficult time…and to acknowledge those who are missing someone they love. I have placed an order for several such items this week and will be doing some giveaways here on the blog. And…for those of you slugging it out in the thick of grief right now…keep on keepin’ on and keep holding on to the One who is able to carry you with His strength, comfort, love, and grace. A couple months ago, I received an email from Phenix and Phenix Literay Publicists requesting that I consider reviewing Seasons of Solace by Janelle Shantz Hertzler. I wasn’t sure at first, partly because I don’t feel qualified to review someone else’s book. Who really is going to care about my opinion? And to be honest, I am always a little afraid to do something like that, because…what if I don’t like it? Then, what will I say?? For those reasons and because of our busy schedule…it took me awhile to respond. When I finally wrote back, they promptly and graciously sent me a copy of the book. Wanting to give it my full attention, and still a little nervous about giving my review, it waited on my nightstand a little while longer. I finally read the book last week, and began working on this post a few days ago. I opened the book to find Janelle’s heart-wrenching journey woven in poems alongside pristine photography, depicting the beauty of God’s creation, a place I myself find great peace and comfort. Sometimes I like to just sit and breathe in the beauty of the world He made. There is some sort of restoring comfort in the soft green grass, the swaying trees, the sound and feel of the wind as it blows past, the seasons that march on regardless of the tempests tossing our lives, the songs of the birds I imagine as songs of praise to their Creator. I love how she begins the book by telling of the stark beauty of a red leaf laying among jagged stones. “Radiant, it lay dying. It was that beauty and death intermingled that captured my attention.” (Seasons of Solace) It was with those words that Janelle captured my attention. For, it is my life’s work and heart’s desire to tell the story of the beauty waiting in the ashes of sorrow. Her poetry is raw and beautiful. I wondered how she would “take us on her journey” with poems. A lover of words and poetry, I was intrigued by the notion. She conveyed through every page the steps of her journey, and mixed along the way were the gorgeous photographs of creation. I felt that I was with her, when she heard the news of her husband’s death, when she stood at the funeral, when she asked her “Why-questions”, as she found healing through the pouring out of her words. I could relate to the feeling of listening to the grief and sorrow of others in the moment when your own grief weighs so heavily and suffocating on your heart. It reminded me of standing in the receiving line, after the death of my son, and later next to my mother’s body, offering comfort to those who had come to comfort me. Janelle’s book is lovely, honest, heart-wrenching, and soothing. I am so grateful that she and her staff shared it with me. For more information, please visit Janelle’s website: Journey Through Grief. After I started writing this post, I noticed that Holly (who had reviewed the book a little while ago) was interviewed by Janelle for her website. To read Holly’s wonderful interview, her review of the book, and for links to Janelle’s site…visit Holly’s blog here. You did such a great job, Holly! I’m so proud of you, girl. Since I’m doing a post of reviews, I would be remiss if I neglected another interesting book I’ve recently read. Almost as interesting is the way I came upon The Heart Mender by Andy Andrews. The only thing I love better than a good story is a good story behind the story. The first time I heard about The Heart Mender was in April at the Women of Faith conference. Andy was there to speak on Friday. Holly and her cousin went in our place while Becki and I visited hospitals in the Columbus area. So, I missed his high-energy delivery at the conference. The next day, as we looked over the Women of Faith brochure, Jennilee, who sat next to me talked about his book. She had recently reviewed it through an organization that allows bloggers to receive free books in exchange for their reviews (great idea, huh?). She said it was a story about forgiveness. I thought it sounded like a worthy read, and almost purchased it. But, decided against it. Then, I saw a display at a book store, when I placed an order with a Christian book distributor and it popped up in the “You may also want to buy…” section, and other places I can’t remember. I was always thinking it looked like an interesting book, and I loved the title. But, I just didn’t have time to read right then. So, I continued to resist the constant prompting to read this book. It was almost summer when a package arrived at our P.O. Box from none other than Thomas Nelson publishing. Enclosed was a letter from them expressing their appreciation for our ministry and offering the enclosed book as a gift. Guess what the book was. The Heart Mender, of course. Awestruck, two thoughts drove me to sit down for a minute. The first thought, I’ll admit, was a bit of surprise and delight to think that someone at Thomas Nelson Publishing knows that Sufficient Grace Ministries exists and took the time to look up our address and send such a gift. I’m a writer at heart. So, this was no small thing to me. (Although, I’m sure it’s really much less of a deal than in my imagination!) Secondly, it was quite evident at this point that I was supposed to read The Heart Mender. God has been whispering to my heart, revealing truths I had buried so deeply that I didn’t know they existed. I am a forgiving person by nature. Those close to me will testify that to be true. So, why this book? Why did I need to read it? The past several months, God has revealed to me that there are a few hurts in my life that I haven’t yet reconciled or forgiven. When we were doing the Threads of Hope study on the Walking With You page this spring, emotions of hurt and anger bubbled up from a hidden place. It was so unpleasant, and I’ll be honest, I wish it all would have just stayed far in the recesses of the place I’ve kept it. The reason I am so forgiving, after all, isn’t because I’m such a saint. It’s because I can’t stand to have something between me and another person. I don’t want to hold on to anger, sorrow, or bitterness. I want to bathe in the mercy and grace I’ve been given and want everyone around me to experience the same mercy and grace. I selfishly embrace the freedom of forgiveness any time I am able. The intensity of these emotions left me unsettled and running for the Doritos. When summer finally beckoned, I yielded to God’s tug to read this book, spread out my favorite picnic blanket and laid on the green grass in the shade as I began the journey of The Heart Mender. Set during World War II, the story is one of adventure, love, forgiveness, and finding hope through the hopeless. I became immediately drawn into the story of the American girl who had lost everyone she loved and the German soldier who carried his own battle scars. It was a captivating and lovely story. It’s message, just one more whisper, one more reminder to my own heart that hope does indeed spring eternal from the human heart, no matter how much a person has been chewed up and spit out by this life. And, secondly that there is always beauty and freedom in choosing grace and forgiveness. I shared awhile back that I read Angie Smith’s I Will Carry You. It was such a beautiful read. I have read Angie’s story before, but reading her book as it was woven together with pieces that I had not read before felt just like sitting on the porch with Angie as she told her story. It was the story of Audrey Caroline and her family, told with the beauty and grace that Angie always writes…with a gentle whisper of God’s love in every word. Her words lift me as I read them. They are just that gentle and full of His love and hope. Her book is the same, and I’m so grateful for the privilege of walking with her on this journey…through her blog, in my prayers, and now through her book. Read it with a box of tissues. And now…the final book in this long post of reviews, one of my favorite authors… Karen Kingsbury author of Take Three…the latest in this series that tracks the Flannigan family, the beloved Baxter family, and other intriguing characters. I’ll admit, I devour Karen’s books, and many times refuse to read them until the whole series is written. That way, I don’t have to wait for the next one. I will read all day and all night if time allows (which it usually doesn’t, of course!) My mind becomes preoccupied with the characters and I sort through some of my own struggles as I watch them try to make sense of this life. It’s sort of like therapy…only free if you check out the books from the library, which I generally do! Honestly, I can probably, with complete confidence, recommend almost any book Karen has written if the ones I’ve already read are any indication. I love her. (And not just because she mentions Sufficient Grace on her link page! Although, that totally blesses my socks off!) Her heart for Jesus and for the people He died for shines forth in every word of the books she writes. God has given her an amazing gift…and she is using it for His glory. Love, love, love that! My particular favorites are any of the Baxter series books along with the Above the Line series. If you haven’t read them yet, I would start with the Redemption Series. Read through all of the Baxter family books. Then begin the Above the Line books. Hoping you have a little time to spread out a blanket in the shade with a cup of cold lemonade and a good book this summer. It really is some time well-spent. Have a lovely weekend! P.S. I just started a new discussion at the Sufficient Grace Gathering Place Blog Frog community asking the question: What are you reading this summer? Please join in! Donate $5 to SGM to receive this beautiful Remembrance Ribbon by clicking the Donate button below. Follow Sufficient Grace on Bloglovin’!